Home Blood, Heart & Circulation Can You Have a Heart Attack and Not Know? Usually when you are suffering from a heart attack, you are aware of it because you are experiencing symptoms. The main symptom, severe chest pain, is usually extremely obvious. Most people know about chest pain and heart attacks. What few know is that it doesn’t always happen the same way in every person. Yes, of course. Not everyone experiences the typical clutching of the chest with a falling to the floor like you see on television. Sometimes the symptoms you experience are completely unrelated to your chest so you don’t know that the problem is with your heart. In fact, it is a common phenomenon among diabetics to have few symptoms of a heart attack or no symptoms at all. Research tells us that about 20-60 percent of all heart attacks occurring in those over the age of 45 are completely unrecognized and are considered "silent heart attacks". The older a person gets, the greater is the chance of having some kind of silent heart attack. What Happens During a Silent or Mini Heart Attack? Those who suffer from silent heart attacks usually have very non-specific symptoms or symptoms so subtle they don't notice them. They may feel they are suffering from a strained chest muscle, a strained back, a case of the flu or indigestion. The pain from a heart attack may not be in the chest at all but may instead be felt in the upper back, arms or in the jaw. Others will simply feel a long period of unexplained fatigue as their only symptom of a heart attack. These less specific symptoms can be completely ignored by the individual or may be attributed to some other condition. Can you have a heart attack and not know? Well, it can definitely happen. How Can You Tell If You Have a Silent Heart Attack? If you already know you are at an increased risk for a heart attack, your healthcare provider may perform an electrocardiogram or EKG on you. This is a resting test that assesses the electrical activity of the heart. You should have one each year at the time of a regular checkup. If the electrocardiogram shows evidence of Q waves on the reading, it means you have suffered from some sort of heart tissue damage and may have had an undetected heart attack. You are considered high risk for a heart attack if you carry at least two risk factors for the disease. Some of these risk factors include having high blood pressure, a family history of heart disease, obesity, inactivity, a history of smoking, an elevated LDL cholesterol level, a low HDL cholesterol level, type 2 diabetes or elevated triglyceride levels. Those at the greatest risk of having a silent heart attack include women and those older than 65 years of age. People with type 2 diabetes also have a greater risk of having a silent heart attack. Can you have a heart attack and not know? While it is certainly possible, most people have some symptoms. Like all muscles of the body, the heart needs enough blood in order to do its job. The blood for the heart is carried via the arteries to smaller arteries that service just the heart muscle. When these arteries (known as coronary arteries) become clogged with plaque and blood clots, the heart will not get enough oxygen and you can easily have a heart attack. Occasionally, heart attacks will be very intense and come on suddenly like you see in the movies. In such cases, there is no question that the person is having a heart attack. Most heart attacks, however, come on gradually with minimal pain or discomfort in the beginning. Discomfort in the area of the chest. It usually occurs near the center part of the chest and lasts longer than just a couple of minutes or comes and goes. Some people experience it as just a discomfort, while others will feel a squeezing sensation, frank pain in the chest, or a sense of fullness in the chest. Other areas of discomfort. You can also experience pain that radiates to the back, one or both arms, the stomach, or the neck area. Difficulty breathing. 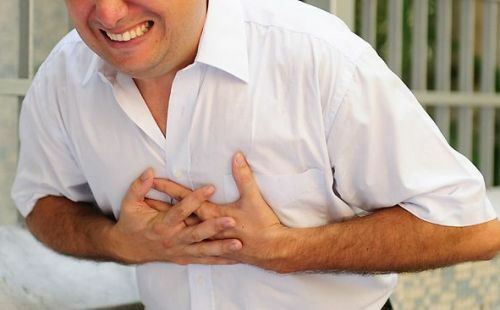 Sometimes this can be the only symptom you experience when you are having a heart attack. Other symptoms. Some people will break out into a cold sweat or will experience lightheadedness or nausea as their only symptoms. Women usually experience chest pain as part of their heart attack but, unlike men, often have other symptoms besides chest pain, especially symptoms of back pain, nausea and vomiting, shortness of breath or pain in the jaw. Can you have a heart attack and not know? Since this is possible, you may not know what you need in terms of treatment. The thing is whether you have symptoms or not, you still need some treatment. If you have been found to have had a silent heart attack, you will likely see a cardiologist and be treated in the same way as you would if you had a known heart attack. For example, the cardiologist may do a cardiac stress test in which you run on a treadmill connected to an EKG machine so they can tell if there is any stress on the heart. If stress on the heart is seen, you may have an angiogram of the heart to see where the areas of blockage are located. You might need an angioplasty, where a catheter with a balloon at the end of it is placed in narrowed arteries and blown up to dilate the arteries. A stent can be placed to keep the artery open. Some may need to have heart bypass surgery in which the doctor bypasses the narrowed arteries using a graft. A dose of 81 mg of aspirin every day may be prescribed. Aspirin acts as an antiplatelet medication to keep you from getting another heart attack. Beta blockers may be indicated to lower the heart rate so the heart doesn’t have to work so hard and so the blood pressure is lowered. ACE inhibitors work to dilate blood vessels so the blood pressure can be lower and the heart will not have to work as hard. Cholesterol-lowering medication will be tried, which often means you will take statin drugs that lower total and LDL cholesterol levels. You will also be asked to reduce the cholesterol intake in your diet. Lifestyle measures may be indicated, such as stopping smoking, exercising regularly, and losing weight. People with diabetes should work to have a hemoglobin A1C level less than 6.5 percent but it shouldn’t be much lower than that because it would mean that sometimes your blood sugar is probably dangerously too low. If you smoke, you should quit right away and try to lose some weight. Take blood pressure medications if your blood pressure is too high and take medications for blood sugar if you can’t get it down using lifestyle measures alone.